True You is a book written by Janet Jackson, chronicling her life journey; in particular how it relates to her body image and relationship with food. When she started her acting career at the age of ten she was told by Hollywood that she needed to lose weight. She began to believe that she wasn’t good enough the way she was; an idea that she battled throughout her adult life, despite achieving international platinum success in music. Besides her book, she is also the new spokesperson for the Nutrisystem Success Program. She turned to food as a source of comfort, which caused the development of a self-destructive pattern of overeating, resulting in depression, which then led to further overeating. Finally, after many years, she has broken free of negative attitudes and become comfortable with who she is, implementing a healthy diet and fitness plan in accordance with realistic goals. True You provides readers with insight into Janet Jackson, as she shares the ups and downs associated with the challenges of her career and personal life. Jackson encourages readers to learn to accept themselves and let go of the emotional and mental obstacles that are blocking their ability to experience happiness. The book includes a chapter written by her nutritionist, David Allen, outlining the diet and exercise regime that she followed to get in shape for photo shoots and public appearances after she gained weight in 2005, reaching 183 pounds. At this stage she undertook a variety of tests and he determined that she had developed dysbiosis of the gastrointestinal tract, was borderline type 2 diabetic, had systemic inflammation, was in the latter stages of adrenal fatigue and showed signs of poor liver function and secondary hypothyroidism. He then started her on a 21-day cleansing program that was tailored to fit her specific needs. The diet plan involved the use of a special nutritional shake combined with a variety of healthy foods such as fruit, vegetables, whole grains and lean proteins. During the weight loss phase of her program she consumed virtually no sodium or sweeteners. Janet Jackson lost over 20 pounds in just one month without doing any exercise. Janet is known for her six-pack abs – achieved by grueling workouts – but Allen actually ordered her to refrain from exercise for these three weeks so as to allow her body to heal and to reset her metabolism. Then Jackson moved into phase 2 of the program where she had to increase her caloric and nutrient intake to match her increased physical activity. After 18 weeks she lost a total of 56 pounds. Oats, quinoa, pasta, strawberries, blueberries, peaches, apples, spinach, lettuce, cauliflower, mushrooms, sweet potato, kidney beans, eggs, cheese, Greek yogurt. chicken breast, turkey, soymilk, almonds, salsa, avocado, olive oil. True You: A Journey to Finding and Loving Yourself retails at $16. Click here to purchase True You at a discounted price. Will be of special interest to Janet Jackson fans. Includes a variety of recipes that were tested by Janet. Many of the recipes are designated as “kid-friendly”. Highlights the importance of dealing with emotional issues to support long-term weight loss. Does not contain a meal plan or exercise guidelines. True You is not a comprehensive weight loss program. Will probably not appeal to readers who are not fans of Janet Jackson. 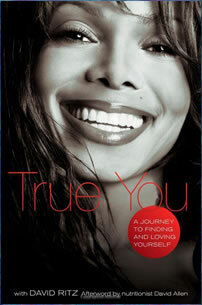 True You is a book written by Janet Jackson that is a combination of a memoir, self-help guide and nutrition plan. Jackson writes about elements of her personal life, with an emphasis on her body image and weight fluctuations. True You also includes a chapter written by her nutritionist and a selection of healthy recipes that readers can use to create their own healthy weight loss program.